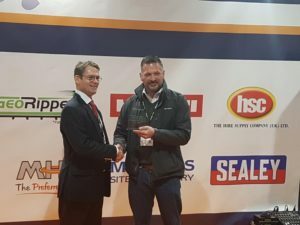 Our Hire Manager Kevin attended the Executive Hire Show in Coventry today, to award one of our many hard working depots an award for ‘Best Hire Operation’ on our national supply chain. The award went to the the Toga Plant Hire depot in West London, with runners up being Concord Lifting, St Neots depot and Hireforce Birmingham depot who were both presented with and awarded runner’s up prizes too. Their team’s hard work this year and every year help us to operate as efficiently as we do, meaning year on year we’re able to pride ourselves on our reliability and overall service, and here’s to another great year in 2019! Our Hire Manager Kevin (left) presenting the award to the Depot Manager Lee Ebdon at the Executive Hire Show.